Ima Sabitri, a Manipuri documentary film, directed by Bobo Khuraijam has bagged the best documentary film award at the 15th edition of Mumbai International Film Festival in the national competition section. The festival was kicked off on January 28 and it is held biannually in Mumbai. The award ceremony was held at Tata Theatre, National Centre for Performing Arts, Mumbai on February 3. The award consists of a Silver Conch, cash prize of Rs. 5 lakhs, a citation and certificates. The citation reads, ‘For the aesthetic vibrancy that takes us into the intimate world of celebrated theatre actress’. The Manipuri documentary explores the life of the theatre legend Sabitri. Maharashtra Governor C. Vidyasagar Rao was the chief guest in the international film festival, organised by Films Division under Union Ministry of Information and Broadcasting. This year the festival received a record number of 790 entries from 36 countries across the world. Out of the total entries 43 films were selected for national competition. The film is produced by Gurumayum Ranita under the banner of Masek Mangal Films, cinematography is done by Irom Maipak, edited by Sankhajit Biswas and music is given by Heisnam Tomba. The film was the opening film of the Indian Panorama section in the 47th edition of International Film Festival of India, Goa. 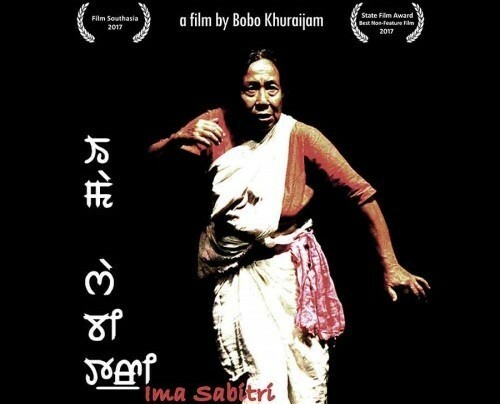 Besides claiming the best non-feature film in the State Film Festival, 2016, Ima Sabitri has participated in some of the prestigious international film festivals such as Film South Asia, Kathmandu, Women Of The Lens, London, Kolkata International Film Festival, Kolkata, XIV Kinoproba, Russia and others.